Hundred Nights Now Accepting Cryptocurrency Including Bitcoin & Ether! The same year Bitcoin was released by its anonymous creator Satoshi Nakamoto, Keene’s privately-run cold weather shelter and drop-in center, Hundred Nights, was also launched. I reported at the time on founder Don Primrose‘s courageous civil disobedience of opening without the permission slips from the local ruling gang known as the “City of Keene”. Ever since, I’ve been a supporter of the unique approach that Hundred Nights has taken to helping the homeless. Rather than give them a place to stay every day of the year, Hundred Nights opens for the hundred coldest nights. At 7am, all those staying overnight have to get their stuff and leave for the day. They aren’t completely out in the cold, as Hundred Nights also operates a drop-in center open year-round, where the homeless can work on finding jobs, putting together a resume, or just get warm. Recently, the Monadnock Decentralized Currency Network (MDCN) donated 1% of a Bitcoin Core (BTC) to the auction that Hundred Nights put on in December. The MDCN also offered to match the dollar amount of the winning bid on the coin as a BTC donation to Hundred Nights, up to a maximum of one whole BTC (which at the time was worth about $15,000). Turns out, despite having the chance to bid, a room full of mostly older folks only resulted in one bid… of $25. It was a lady buying it for her son, who had been telling her about cryptocurrency. Given that the bid was so low, it was decided that a matching 1% of a BTC (worth around $150 at the time) would also be donated to Hundred Nights, rather than just $25. I dropped in to the office of Hundred Nights’ Executive Director Mindy Cambiar and helped walk her through signing up with Coinbase. While I’m not a big fan of Coinbase as a company, they do make it easy for people with bank accounts to acquire cryptocurrency as well as convert it to USD if they need or want, so I still recommend them to newbies. Indeed, within a short time, Hundred Nights was ready to accept cryptocurrency donations and the addresses are up now on their website. Whether you live in the area or not, if you’re a cryptocurrency user, please send them a donation to thank them for embracing the future of money! All Cryptocurrency’s Total Global Value Over $420 Billion! What a ride! The total market cap of Bitcoin and all other cryptocurrencies combined passed $420 billion for the first time yesterday! For some perspective, keep in mind that the global market cap passed $100 billion for the first time in early June. It hit $200 billion five months later in early November, then about three weeks later hit $300 billion. It only took ten more days for the total market cap to pass $400 billion. With some exceptions, overall, the rest of the cryptocurrency prices trend upward when Bitcoin Core (BTC) is going up. Bitcoin Core has been on a meteoric rise, with nearly a 2000% increase in its US dollar value in the last twelve months! Yesterday, BTC eclipsed over $16,000 according to BitcoinAverage.com. Two days prior to that, it was at $12,000. When will these steady gains come to an end? Hard to say. Many fear a huge crash is coming, but then again cryptocurrency is uncharted territory. Just because there was a big crash in bitcoin in 2013 doesn’t mean anything for what’s happening now. The market was so small then by comparison to today. If you look at the market cap chart above, you can see that “big” crash at the end of 2013 – but it barely registers as a little speed bump, peaking then at around $13 billion, when compared to the monstrous $420 billion of value in all cryptos today. Corner News’ owner Roberta Mastrogiovanni poses with her store’s brand new Bitcoin Vending Machine! Obviously, rule number one of investing is don’t invest what you can’t afford to lose. If you’ve got money in cryptocurrency and you’re spooked and want to cash out, go ahead, just don’t cash it all out. Also, consider diversifying into other cryptocurrency besides BTC. That said, rule number one of bitcoin has always been to hold on for the ride. Don’t let the downs get to you. They will come at some point; the only question is how deep the price drop will be and for how long. It’s important to keep perspective – we’re still in the early days of this. Even though bitcoin is coming up on its ninth year of existence, it’s still young compared to all other forms of money that have been with us for centuries. This is new territory and anything can happen. Bitcoin Not Forking Again After All? Good Riddance to Segwit2X! Long Live Bitcoin Cash! Is the Bitcoin geek war finally over, or just getting started? After months of buildup, fighting, and controversy, the potential forkers of Bitcoin have blinked. Thankfully, they’ve called off their plans to cause a potentially damaging and very contentious schism to the Bitcoin network. Today, several of the “Segwit2X” developers appear to have written an email canceling the much ballyhooed “upgrade” that was attempting to become the “real” bitcoin. Bitcoin has been going through some ugly growing pains. Its network is full of transactions. Fees have been skyrocketing as a result. Bitcoin transactions that a few years ago were no more than a few cents are now regularly $3-5 dollars. This has killed Bitcoin’s usefulness for small transactions. 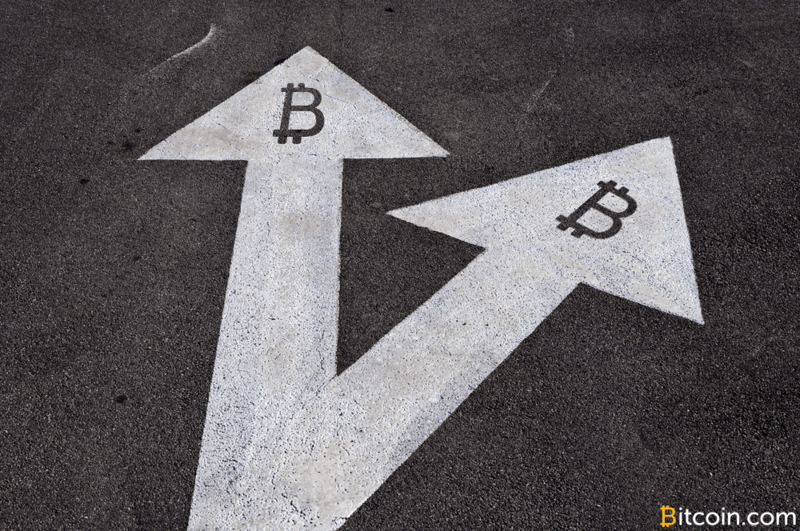 After arguing online for years about how to solve the issue technically, a group of dozens of companies and mining pool operators came together in May to propose a compromise called “Segwit2X”. This would implement “Segregated Witness” and then three months later increase the block size to 2 MB from 1 MB. Both of these changes were supposed to increase capacity. Do you take the road less traveled?